Time has always been a topic of great curiosity for the human being. Many people in the history of mankind have tried to interpret and describe the time. But no one till date has been able to interpret it correctly. Many civilizations interpreted the time in different ways. Religions are too a step ahead in an interpretation of time but the question of the authenticity of their interpretation is always there. The concept of time is linear in Islam, Christianity and other Abrahamic religions. But in Dharmic traditions, time is always regarded to be cyclic in nature. 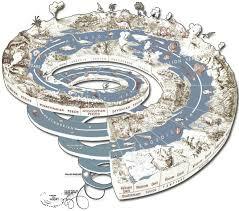 Time is cyclic in dharmic religions and there is a concept that this creation repeats itself. Repetition in a sense that time with similar character is observed in the equal interval. The main aim of human life in Dharmic traditions is to be liberated from the endless cycle of time i.e. birth and death. Hindu scriptures state time is relatively different in different lokas. Furthermore, there are smaller units of time like ' Krati' that is equal to 34000th of a present-day second. And Truti that is equal to the time taken to tear the softest petal of lotus. So, after a short description of smaller units of time now let's have a look at what scriptures say about months, years and a larger interval of time. Now for the measurement of months, years and other larger interval of time we can use either the lunar calendar or solar calendar. Once again quoting the Surya Siddhant it has descriptions of both solar and lunar calendar. About the lunar calendar, it states that moon New Moon occurs when the moon comes nearest to the sun in the sky and time from one New Moon to next New Moon is called one month in lunar calendar. Now after New Moon when the moon revolves 12 degrees east then pratipada is passed from 12 to 24 degree with Dwitiya is passed this continues with the change in a thithi with every 12 degrees of rotation and full moon occurs between the angle 168 degrees to 180 degrees. This phenomenon continues in next semi-circular direction this time the 15th Tithi will be the New Moon at the angle 348-360 degree. This is one month. The fortnight from New Moon to full moon is called Shukla Paksha and next fortnight is called Krishna Paksha. This was all about the lunar month. Now about Solar month the same book Surya Siddhant states "The path followed by the sun in the sky is called its 'Kranti vritta'. 1/12th of this Kranti vritta is a 'Rashi'. Each Solar month is allocated to a Rashi (Zodiac signs). There are 12 months and 12 Rashis too. The limitation of Surya Siddhanta is that the earth is taken as the centre of the solar system. I tried to describe briefly about Hindu measure of the day, month and year. Hindu scriptures state that the relative measure of time is different for the Supreme soul (Brahm); the Trinity (Brahmaa, Vishnu, Shiv); Devtaas and Asuras and earthly beings. Let's discuss from the Earth first. The idea about a day, month and year that I have given in previous paragraphs was for Earth. Earth has a year of 365 days. But for Devtas one human year is equal to one day (Here one day means a day and a night comparable to 24 hours on Earth). According to a translation of Surya Siddhant by ‘Mahavir Prasad Srivastava' “In North and South Pole length of a day, time is 6 months and one year is equal to a day and a night. So, this region might be the land of devas and asuras respectively". However, this assumption is not true. The time mentioned in scriptures is not just geographical but biological too. Vishnupuran in its third part states "Devtas’ 1 year comprises of 360 divine days ('Divya Din': 1 divine day comprises of a daytime and a night time. A divine daytime is of 6 months and devta’s night is of next six months. Hence, divine day or a Divya din is of 1 human year) and this year is called 'Divya Varsh' (Divya Varsh is Sanskrit word for divine year). Thus 1 Divine year is equal to 360 human years. Kaliyug is of 1200 divine years that is 432,000 human years. Each yug has some time allocated for 'Sandhya '. Morning of a yug is called ' Aadi Sandhya ' and Evening is called ' Sandhyamsa'. For example, morning and evening of Satya Yug are of 400 and 400 divine years respectively. So, the main yug is of 4,000 divine years. This means both ' Sandhyas' are of equal length. Sandhya for Treta, Dwapar and Kali are 300 & 300 divine years, 200 & 200 divine years and 100 & 100 divine years respectively. 71 cycles of this Yugas i.e 71 Mahayugas is called 1 Manvantar ( Manvantar = Manu+Antar, the time when manu is changed). Arya Bhatta in his book ' Arya Bhatiya' has made a disagreement regarding this. As per him 1 Manvantar = 72 Mahayugas. According to Hindu scriptures, the first man for each Manvantar is different for example the name of first man 'Manu' of this Manvantar is' Vaivaswat ' manu. According to Vishnu Puran, ‘the water apocalypse’ occurs at the end of each Manvantar. Manvantara also has Sandhya but only once per Manvantar and its length is same as the length of Satya Yuga. 14 such Manvantar makes 1 Kalpa. Both Manvantar and Kalpa has one Sandhya at their end. 1 Kalpa is equal to a day time of Brahma and next Kalpa is equal to a night time of Brahma. A Brahma year consists of 360 days. Hence, 720 Kalpas or 10,080 Mahayugas or 40,320 yugas that are 43,545,600,000 human years is equal to a year of Brahma. The lifespan of Brahma is 100 years that is 4,354,560,000,000 human years. This same is the life span for Vishnu and Shiv too. Finally, the Supreme Soul (Brahm) is above time and time doesn’t affect that entity. Firstly, we must know 6 Manvantaras have already passed. The current one is the 7th Manvantara its name is 'Vaivaswat' manu and presents one is its 28th cycle and currently, 5119 years of Kali Yuga has passed. Now, let’s evaluate. There might be small errors but generally, we can find the calculation of the age of the creation around this value.